What Muscles do Fist Pushups Work? Although many top exercises for improving your body composition require the use of weights and other equipment, pushups can be effective yet require only your body weight. Pushups target your upper body muscles and provide a similar workout to the bench press, albeit without added equipment. To add an extra challenge and variety to your workout, you can perform variations of pushups, such as fist pushups. 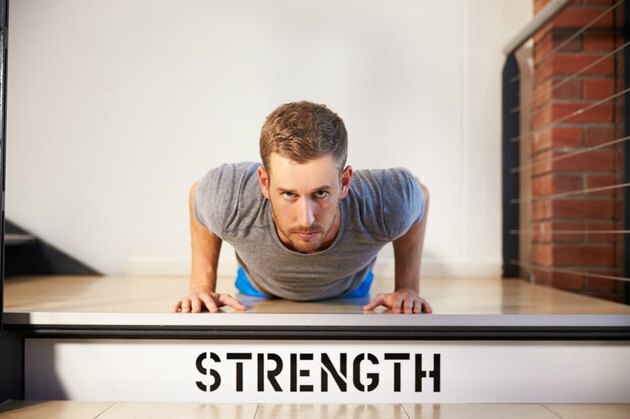 Performing fist pushups is very similar to regular pushups, but the slight alteration in hand position dramatically improves the effectiveness of the exercise. Instead of performing a pushup with your hands flat on the ground, you should support your body with your fist closed and your knuckles to the ground. Your knuckles can be forward or out. You may wish to perform this exercise on an exercise mat rather than the floor to prevent discomfort. Because your fists provide a smaller amount of surface area than your open palm, your muscles have to work harder to support your body. The primary muscles worked in fist pushups, as with regular pushups, are those of your chest. These muscles are known as the pectoralis major and the pectoralis minor, and they help drive movement of your shoulders and arms. Your chest is emphasized more with knuckles forward in the fist pushup. In addition to fist pushups, you can perform cable crossovers, bench presses and the incline fly to improve your chest muscles. Your shoulders, also known as your deltoids, are also used when performing fist pushups. Your shoulders help to move and rotate your arms and have a primary role in throwing and other athletic motions. You can use many exercises to build muscular strength in your shoulders, such as standing military presses and dumbbell side raises. Your triceps are located on your upper arm and training these muscles can be the key to bigger arms, as they provide the majority of the muscle mass on your upper arm. Your triceps aid in pushing and throwing, so they can be important for a variety of activities. Your triceps are heavily engaged with your knuckles out in fist pushups. In addition to performing fist pushups, you can improve triceps strength through dips and the close-grip bench press.